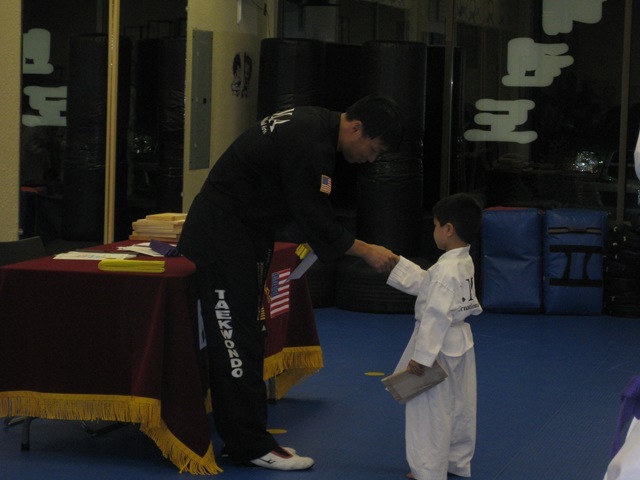 The Yellow belt test at first seemed like it would be a breeze for Caleb. Most of it was punching and kicking which he could do well. There was another section on reciting Korean words. We clearly had an advantage on this one as Caleb already knew most of the Korean words and the other kids were mostly Hispanic with no predisposition toward Korean. But, there was a final requirement – busting through a board with your bare fist. 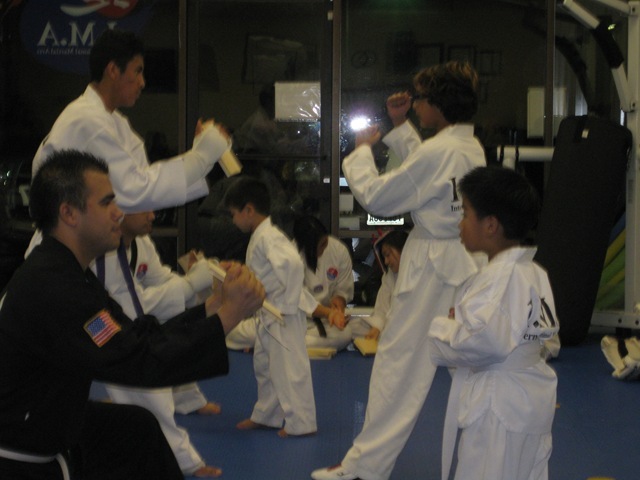 When the instructor was telling Caleb this particular requirement, I smiled an uncomfortable smile at the edge of the DoJang (Tae Kwon Do Studio). 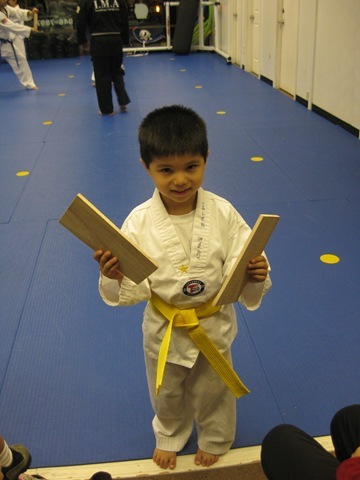 Was my little 5 year old boy really required to break a board to get his yellow belt? 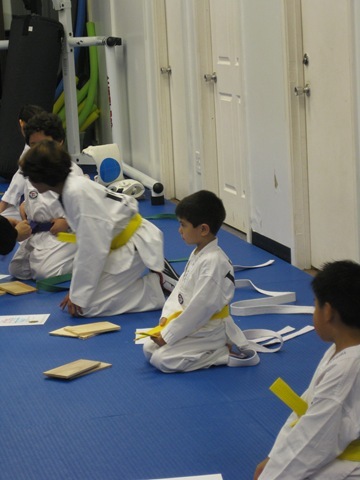 I got up to Green belt, but I don’t remember breaking any boards. 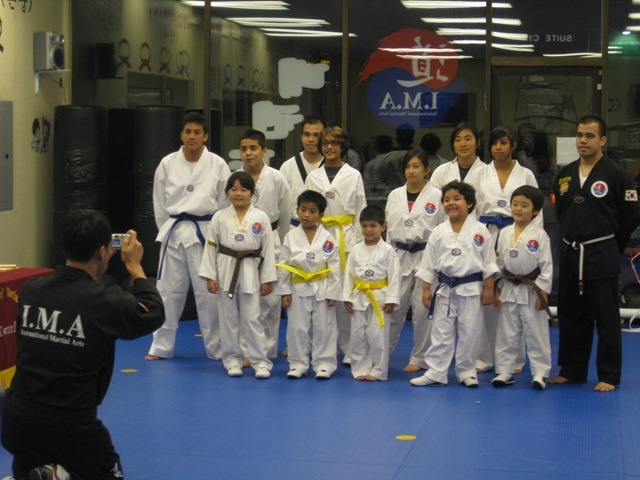 Usually that was left to the Red and Black belts in exhibition type events! I wondered if he was joking. But, the seriousness in which he told Caleb made me worry. Perhaps, it was a way to keep little kids from advancing too fast. I could tell that Caleb had some apprehension about this too. Sometimes he mentioned it and asked me if I thought he could do it. I tried to be encouraging, but I didn’t know. The day finally came, and I took off from work a little early, so that I could watch this day. Needless to say, Caleb was very excited. He had been punching and kicking every day that week. Maybe even a little more than usual. We studied all the Korean words that he was supposed to know, and he had mastered counting to 10. He could probably actually count to 30. 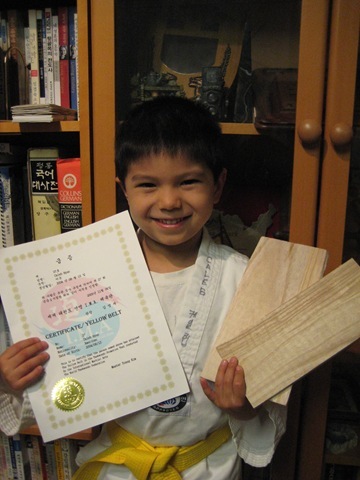 He grabbed his now split pieces of wood and sat down at the edge of the mat anticipating his award – the yellow belt. 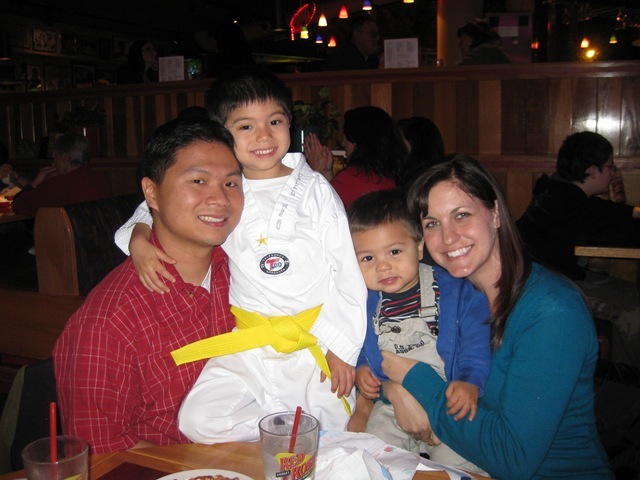 After all of the belts were handed out, he came over to us, his family, and beamed as he held up his split piece of wood, his yellow belt certificate, and his old white belt which was now replaced by his new yellow belt which he wore. Next Does Santa really exist?